I occasionally use Artrage Studio Pro for tracing images or animating sketchnotes. The interface doesn’t lend itself as well to real-time sketchnoting, although the natural media support might be interesting to play with if I want to play around with watercolours. I’ve also been looking for a way to project the drawing as a whole while I’m zoomed in and working on part of it. This will let people see the context without getting dizzy or distracted by the way I zoom in and out. Views allow you to “pin” a view of your canvas while you’re working on a different part. I tested it with an external monitor and confirmed that you can drag the view pin off your main Artrage window and onto the second screen, and that you can resize it to almost fill the screen. If I ever need to do projected sketchnotes (the request has come up once or twice, but in the end people opt to focus on the speaker), this might be a possibility. Click on the hard freehand lasso preset I’ve saved to my toolbox. Select the section to move. Click on the large tool icon and choose Transform. Drag the image. Be sure to start dragging within the bounding box of the part of the image that has data, because it won’t detect it if you’re dragging from empty space that you’ve already highlighted. Click on Menu > Edit > Deselect all, or you won’t be able to draw outside the selected region. Click on the lasso tool. Select the area I want to move. Move it or resize it using the puck that appears when I hover inside the selection. 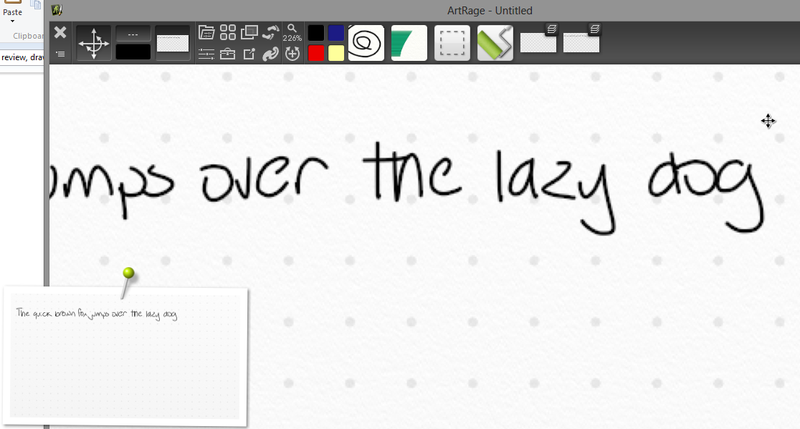 Switch back to a drawing tool to start drawing anywhere in the screen. There are keyboard shortcuts for Transform and Deselect all, but I usually don’t have keyboard access while I’m in tablet mode. I might revisit this for sketchnoting if I can stitch together some keyboard macros (maybe using a foot pedal or the Twiddler), but in the meantime, Autodesk Sketchbook Pro will be my workhorse. I’ll play around with Artrage’s drawing and painting support to see if I can build other non-sketchnoting artistic skills/techniques using that. Anyway, it’s good to see progress in applications! Thanks to Luc Taesch for the nudge to check out Artrage 4!